Explosions happened and they decided to bail before everyone died. That is a change for that group. They used to do last man standing. We chased them down but we were unsuccessful with catching the stragglers. We then went back to loot the field when local spiked with a Navy Raven. Wat? Like hounds our heads swiveled to the scent. We decided to bolt for the high sec gate with one person left to watch the low sec gate. There was a chance that they had come in from high sec but the chance was greater that they were making a run for continuous Empire from the low sec island. This is not an uncommon trip made to bring things in and out. We catch all sorts of interesting things like Orcas, Freighters, and shiny battleships. Our gamble paid off and we landed on the gate with the Raven Navy Issue. Yay! Coms were tense. It is amazing how much information we relay at that point. If he had a micro jump drive we were going to be screwed. None of us had short points. If he was stabbed we'd not have enough points to overcome his stabs. However, we'd make a heroic attempt at it with bumps and tenacity because it was there. That particular gate is a large, constellation gate where people can easily spawn 40k away from each other. Sadly for the shiny, shiny Raven he spawned 10k from the Cynabal and Jaguar. Point. Point. Bumps. Talos burn. Raven down. And followed by his pod. We then learned that the seal club was out in force. No micro jump drive. No warp core stabilizers. Just a Raven trying to bolt to high sec, balls to the wall, throttle to the floor, hair down, heels off, and taking on the world with a Slave Beta in his head. I'd not be writing this with all honesty if it were not for what happened next. Ammaterasu placed 200,000,000 ISK in bounty on your head. 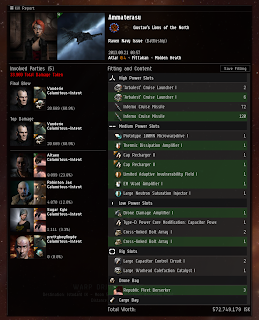 The kill right Ammaterasu has on you has been made available to all for 0 ISK. As always, I have a head desk moment. Low Sec PvP corporation of outlaw sec status people. We are freely shootable in every sector of space. I had also cleared my bounty a few days ago. Thankfully, it is meaningless. A killmail that wasted a billion ISK. WTH was he thinking with that fit? It looks like he just fits/uses whatever happens to drop for him with no regard to whether it makes any sense. cross-linked bolt arrays and a surgical strike implant with missile launchers? With this fit (well, he did get some of the module *icons* right , if not the actual modules) and knee-jerk reaction to podding .. i would say this one was hisec mission runner - sent to losec with some silly storyline mission. But how he could do some of the more difficult lvl4 ones is quite beyond me. It's not a waste of a billion isk if the person who placed it derives satisfaction from seeing it paid out. I don't have to tell you this person was probably pretty wealthy and a billion isk is, well, not much to them.